Jennifer Sbranti is the founder of Hostess with the Mostess®, a creative living and party planning resource established in 2006. 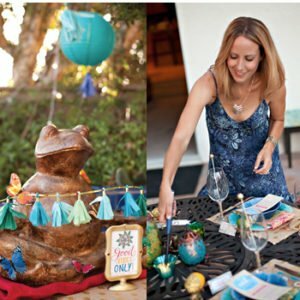 HWTM shares stylish and inspiring ways to “bring the fun!” to special occasions and everyday moments. Sbranti’s work and ideas have been featured in media outlets such as Good Morning America, The Today Show, Real Simple, People, InStyle Weddings, Extra! TV, and more. 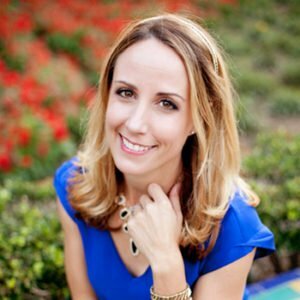 She has designed creative content and unique events for several well-respected brands, including Mattel, Coca-Cola, The Hershey Company, Toys”R”Us, Pottery Barn Kids, Chambord, Wendy’s, and Starbucks. Sbranti lives in Northern California with her husband, Sonny, and their daughters, Macy (8) and Rylie (7). Hi, there! I’m Jenn. 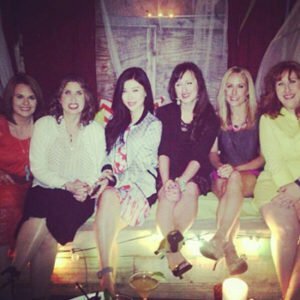 I’m a graphic designer, content creator, and event stylist with a passion for the clever, unexpected details…. the kind that surprise and delight. Before founding HWTM, I worked as a full time print & web designer, but I’ve always had a thing for parties… party decorating in particular! A few years after college, there was a period of time in my life that can best be referred to as “wedding and baby boom”. This is a familiar “era” for many others too, I know. ;) Anyways, I happily jumped at the chance to play hostess at what felt like zillions of bridal showers, baby showers, and bachelorette parties during that time. As a graphic designer that was pretty much glued to the computer all day for work anyways, the internet was the first place I turned to for party inspiration back then. However, I was quickly frustrated by the lack of inspiring ideas that my searches were turning up. (Keep in mind that this was back in 2003-2006, when the blogging phenomenon was still in its infancy and the term “social media” didn’t even EXIST yet!) So…… I just started designing my own party themes and details instead. I avoided what were the stereotypical bridal and baby shower elements back then (interlocking hearts, doves, cartoon teddy bears, etc.) and focused on giving stylish and more personalized party themes some fresh, creative twists to tailor them to the occasion being celebrated. And then something interesting happened… I started getting lots of questions from party guests that wanted to know where to buy things, how to make the centerpieces, where to get the dessert recipes, etc… so that they could use the same ideas at their own parties. After answering the same questions over and over again, I started thinking about how nice it would be to have the information all in one spot that I could just direct people to for quick reference… and thus, the idea for Hostess with the Mostess was born! Luckily, I happened to have experience in web design, as well as an internet-saavy husband that suggested looking into “this new thing called a blog” that would make it easy to get content up very quickly. So…. with a mix of curiosity and excitement, I hit the publish button on my first blog post in June of 2006. I didn’t think it would be more than a side passion project at the time, but after taking a leap of faith and pursuing some of the doors that opened along the way, less than 3 years later it became my full time gig! The online and blogging worlds have changed SO much over the past 12 years, but my love for designing beautiful celebrations and inspiring creativity has not. My family and I are so grateful to our readers for your continued loyalty, kind messages, and support. We hope to keep inspiring you with fresh new ways to bring the fun for many years to come!